There is nothing more special than sitting out on the porch during a warm summer night and watching fields of fireflies... until now. 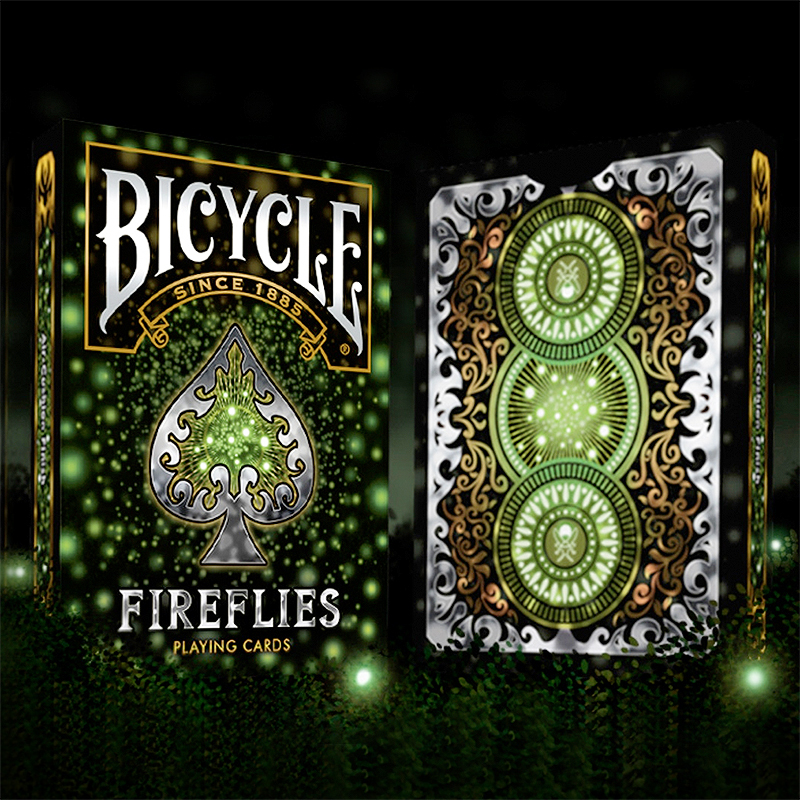 Fireflies Playing Cards bring to you the magic of those summer nights. This custom design will surely stand out in your collection as an instant favorite. Printed by USPCC. Custom Pips. Air-Cushion Finish. The tuck case design was created to really make the fireflies stand out. A pitch black backdrop was incorporated and used with neon greens and yellows to spot the stunning glow effect. In the center the classic spade with a silver accent which goes nicely with the overall look of the deck was incorporated. The back card were created with 3 glowing orbs which gives it a really optical perspective. Continuing with the neon theme along with two little fireflies shining their lights. Some golds and silvers were added to the back as well for more life. The court cards are standard gold and black but still continue the neon specks of flies. For the numbered cards there are hundreds of specks of fireflies slowly expanded from the center to the brim. • The cards are poker size and of the usual Bicycle quality.